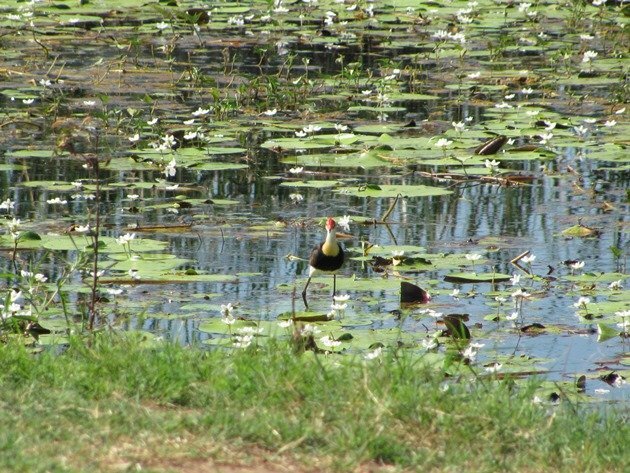 The Comb-crested Jacana Irediparra gallinacean is present in some of the ephemeral lakes around Broome in wet years, but can be absent for several years and then reappear. There are usually only one or two birds when they do venture into the southern Kimberley, but they have bred here in the past. The views are often distant and the flash of red in the sunshine is often the first observation you have and you have to be content with observing from a distance. A typical distant photograph was taken in May 2011 at an ephemeral lake near Broome. 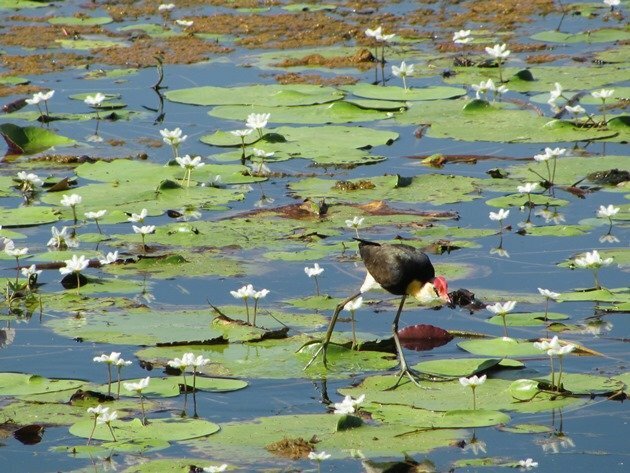 They are a rail-like shorebird with very long legs that trail behind them in flight and prefer freshwater wetlands with floating vegetation. They often make a shrill sound in flight and often don’t fly very far. 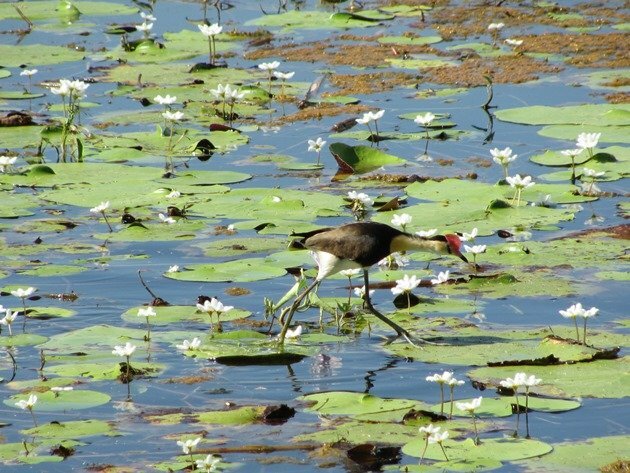 Once you travel further north from Broome there are numerous opportunities to observe this species and any fresh water body is worth checking. Thankfully the red crest is very helpful in identifying this species. On our visit to Parry’s Lagoon Nature Reserve last year there were several juvenile birds, which don’t display a red crest, but have a rufous crown and nape. 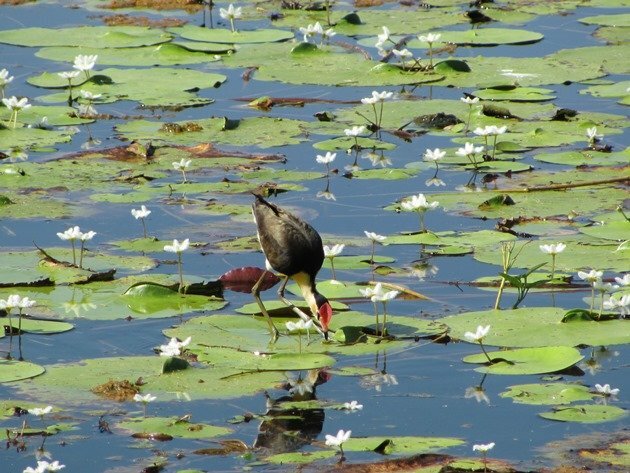 They are easily observed from the bird hide walking on the lily pads, but the best place by far to observe this species is in Kununurra. 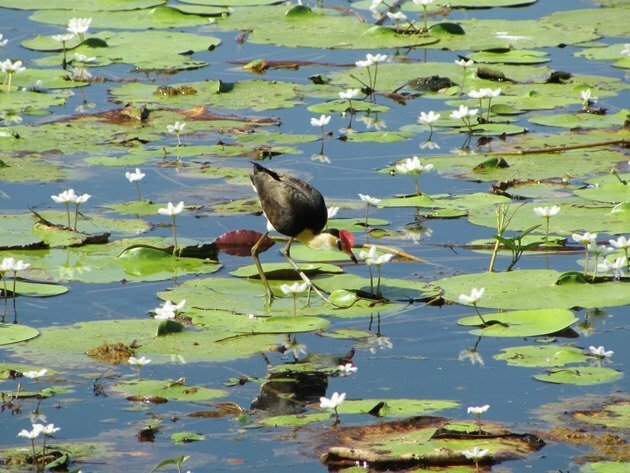 Lily Creek Lagoon is in the centre of town and surrounded by parkland, which is also extremely good for birding. 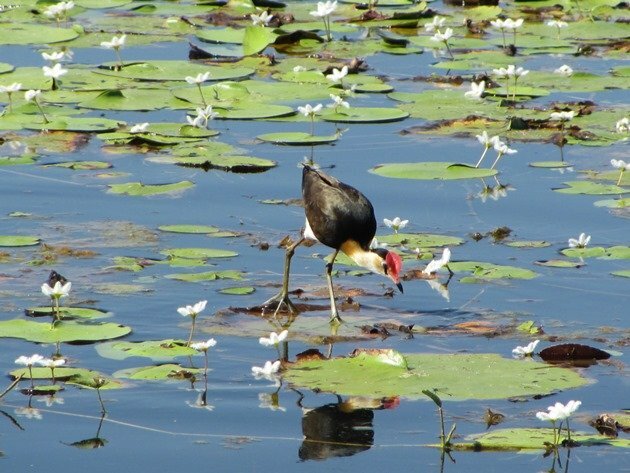 There were over 50 Comb-crested Jacana on our recent visit and it was quite easy to move towards the water and take some photos even with a compact camera. They feed on insects and seeds as they pick through the floating vegetation and they do not feed their young. The female is polyandrous and can defend a large territory laying several clutches of eggs (usually four) in nests built by male birds. The male bird does the majority of the incubation and chick-rearing duties and the adults will carry the chicks under their wings to keep them out of danger if necessary. They do not fly until they are more than 50 days old. 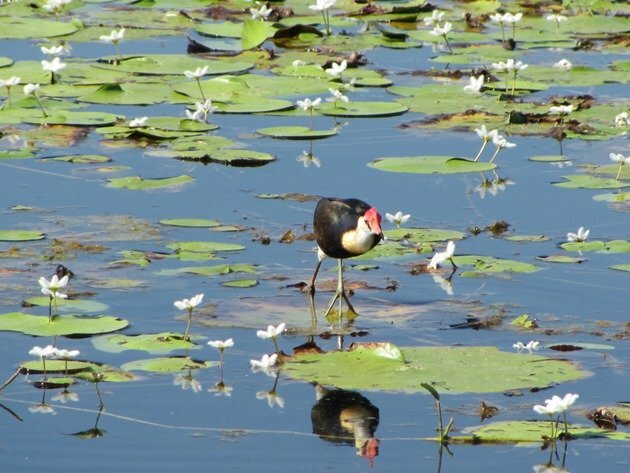 They are present right across the north of Australia and as far south as north-east New South Wales on the east coast, but if you come to Western Australia then Kununurra is the ideal place to find numerous of these birds. It is also close to Wyndham, which is a good place to find Gouldian Finches in the wild and a visit over the border to Keep River National Park should be added to every birders itinerary. Wonderful photos! 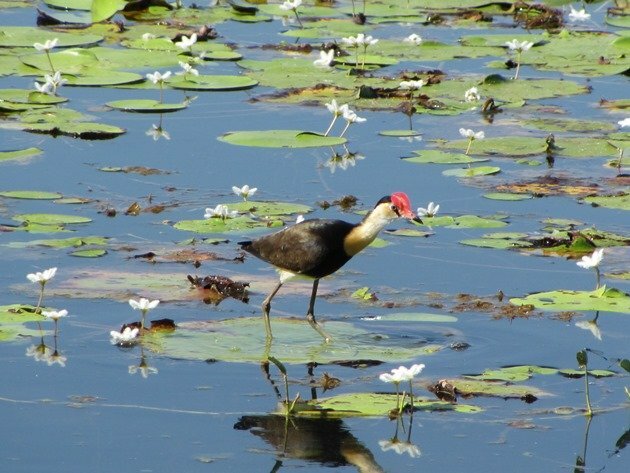 I only recently learned of the jacana when I was researching for a Father’s Day blog post on notable bird dads. I also just read that it is pronounced “zhah-suh-NAH” – is that correct? In Australia we say it as it looks, so Ja Ka Na is probably the best way to describe it. 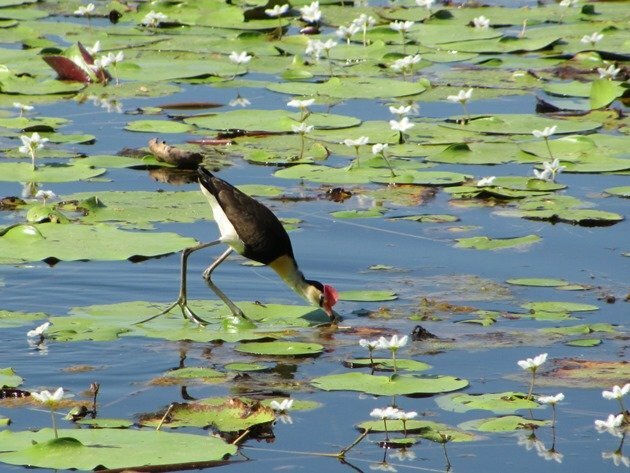 It sometimes gets called Lily trotter or Lotus bird or even Jesus bird, because it appears to walk on water!